Playtech is another huge name in the world of online casinos, providing games, software, support and services to some of the biggest names in the world, since their establishment in 1999. They are publicly traded on the London Stock Exchange, and are based out of the Isle of Man, neighbors with Microgaming. Versatility is Playtech’s greatest strength, offering solutions to companies with existing gaming platforms, or customizable systems for the newer online casinos. Such a huge operation has the man-power to back it up, employing more than 550 personnel all over the globe, 80% of whom are working on research and development for future technologies. Playtech’s website is remarkably open, and I’d suggest anyone serious about their research in choosing safe sites should check it out. The offer information about their history, their finances, and provide ready contact information to those who’d have further questions. Playtech’s products include casino table games, mobile and arcade gaming, poker and bingo networks, as well as unique products like Kiosks and Videobet. The options, as their marketing team emphasizes, are nearly unlimited, giving online operators choices whether they want to streamline, network, or stand apart with complete customization. Playtech is unique as well in their overall tone for the corporation. They advertise their products to be innovative, fresh and exciting- offering up the freshest and most inventive games, graphics, sound and themes, as well as bonuses, and jackpots. Different from many of the major software companies, Playtech itself is run and powered by a younger and more energized workforce, the board believing that their research teams’ talents are fueled by the belief that ‘what’s best for the clients is best for us.’ That mantra could be said to be responsible for Playtech’s ever-present name in the world of big gaming. Even this past week, Playtech found themselves in the news once again, as a major deal was struck with William Hill, granting the latter a division of assets for their Online sector, as well as giving Playtech another domain to power (20Oct2008). The deal has been struck for the next five years. 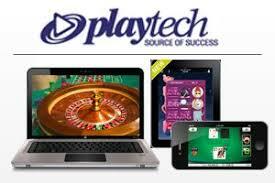 Playtech’s Casino Gaming has plenty to boast about as well. They offer all the major games that a player would expect to find, to their clients, most of which are available in both Download and Flash (No-Download) versions. Their 3D graphics have few competitors in the market, as well as offer some of the most enticing animation and sound options. In addition to excellent games, Playtech has developed a variety of player loyalty tools to assist their clients in keeping membership high, like Refer-a-Friend programs, VIP Ratings, and Comp Point systems. Consistent with their desire to be the hippest software provider, speed counts with Playtech and all programming- from logging in, to actual game play- is guaranteed to eliminate wait time. Customizable game options are a huge plus, giving players the opportunity to adjust their preferences when it comes to sound effects, card sizes, gameplay speeds and even close-up shots. Support is not forgotten with the casino games always having one-on-one gaming support via live chat. And finally, players of Playtech sites have available histories of their game play, and financial transactions- offering clarity and security every time you log in.